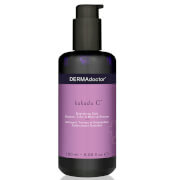 A 0.2% glycolic acid facial cleanser free of soap and alkalis. Regular use will help keep skin looking healthy, smooth and bright. Use 1-2 pumps and gently massage onto face and neck. Rinse well with tepid water and pat dry. Repeat if necessary to remove heavy make-up. GlyDerm is formulated with a proprietary form of esterified glycolic acid to minimize irritation without compromising effectiveness. Water, Sodium Laureth Sulfate, Glyceryl Stearate, Sodium Methyl Cocoyl Taurate, Cocamidopropyl Betaine, Cocamidopropyl Hydroxysultaine, Sodium Chloride, Phenoxyethanol, Citrus medica limonum (Lemon) Fruit Extract, Magnesium Aluminum Silicate, Glycolic Acid, Alcohol, Imidazolidinyl Urea, Sodium Hydroxide, Disodium Cocoamphodiacetate, Caprylyl Glycol, Ethylhexylglycerin, Hexylene Glycol.